The most fundamental responsibility of the government of Ontario is to protect and preserve health care, education and the other key public services that Ontario families rely on every day. One of the reasons for restoring Ontario’s finances to balance is to ensure that the government retains the fiscal capacity to make necessary investments in hospitals, schools and other core services during a time of expected demographic and economic change. Protecting what matters most begins by working smarter and investing smarter. To end hallway health care, the government must put patients first and find new approaches that help make the health care system run better for patients and families. More dollars need to be targeted to front-line workers in the health care system, such as doctors, nurses and other health care practitioners. The government must work towards an education system that is modern and forward-thinking about the workforce of the future. It must focus its resources on those in the education system that need it the most, including students with special needs. It must make changes that respect parents, support students and give educators the tools they need to help students succeed and find good jobs in the modern economy. Protecting what matters most means making every dollar count when investing in the province’s world-class health care and education systems, and other cherished public services. It means providing more choice and access to child care for hard-working parents. 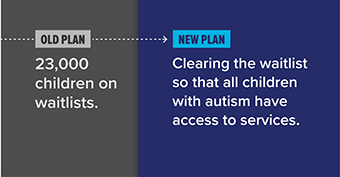 It also means eliminating the autism waitlist, improving community safety and protecting the environment. Ontario will commit up to $1.0 billion over the next five years to create up to 30,000 child care spaces in schools, including approximately 10,000 spaces in new schools. These school-based child care settings will provide safe learning environments for children and offer them the opportunity to grow in a familiar environment. The government is empowering parents to choose the kind of child care that is best for their kids because they know best. This is why the government is proposing to provide one of the most flexible child care tax credits ever introduced in Ontario. The cost of child care can be a barrier to employment, especially for parents with young children. To help reduce the cost of child care, the government proposes to introduce the Ontario Childcare Access and Relief from Expenses (CARE) tax credit that would support working families, particularly families with low and moderate incomes. The CARE tax credit would be one of the most flexible child care initiatives ever introduced in Ontario, putting parents at the centre of the decision-making process. The CARE tax credit would help eligible families choose the care that is right for their children. Currently, families in need of child care may have few affordable options beyond subsidized daycare, which may not be available nearby or may have a long waitlist. The CARE tax credit would provide relief from expenses, enabling families to access a broad range of child care options, including care in centres, homes and camps. 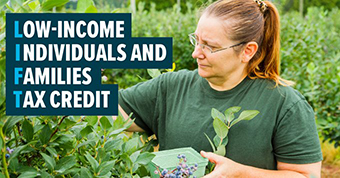 The CARE tax credit would also be easy to access because it would not require families to gather additional information for their income tax forms. With this new Personal Income Tax credit, eligible families would receive up to 75 per cent of their eligible child care expenses incurred as of January 1, 2019. Each year, the CARE tax credit would provide up to $6,000 per child under the age of seven, up to $3,750 per child between the ages of seven and 16, and up to $8,250 per child with a severe disability. 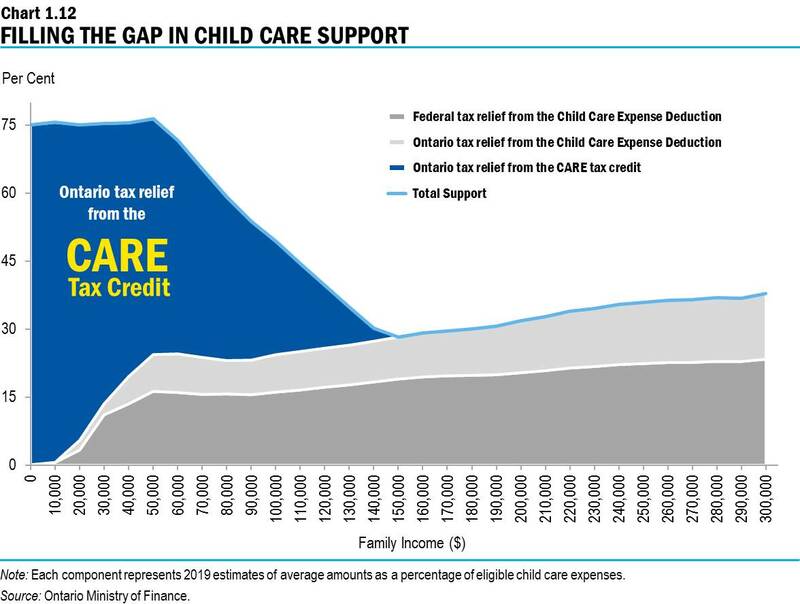 The CARE tax credit would cost about $390 million annually and provide about $1,250 per family, on average, in new child care support to about 300,000 families. 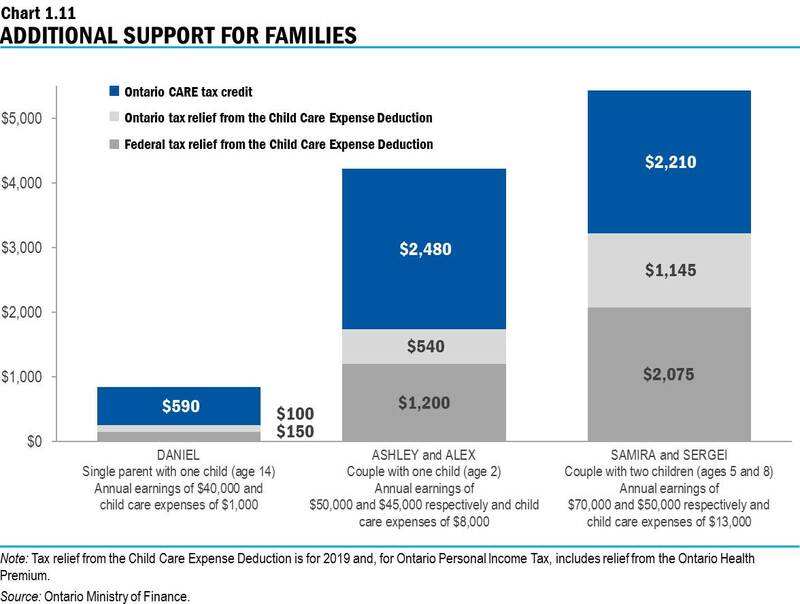 Chart 1.11 shows examples of families (like Ashley and Alex) receiving child care support with the addition of the proposed Ontario CARE tax credit. The CARE tax credit would target relief to eligible families with incomes up to $150,000. The Child Care Expense Deduction, which provides provincial and federal tax relief for eligible child care expenses, provides greater tax relief, on average, to higher-income families as a percentage of their expenses. In contrast, the CARE tax credit would provide a higher credit rate to families with lower incomes, filling the gap in support for these families (see Chart 1.12). Lower-income families who would benefit include those joining the workforce or deciding to work more hours. Families would be able to claim the proposed Ontario CARE tax credit when they file their tax returns, starting with the 2019 tax year. Starting with the 2021 tax year, Ontario would give families the choice to apply for and receive more timely support through regular advance payments during the year. These payments could help offset child care expenses as they are incurred by families, such as when starting new jobs, working more hours or going back to school. Lower-income families benefiting from the CARE tax credit may also receive tax relief through the Low-income Individuals and Families Tax (LIFT) Credit, available as of January 1, 2019, which was announced in the 2018 Ontario Economic Outlook and Fiscal Review. The LIFT Credit is one of the most generous tax credits of its kind in a generation. It provides up to $850 in Ontario Personal Income Tax relief to tax filers who have employment income, helping low-income workers keep more of their hard-earned money. This tax measure is reducing the tax burden on 1.1 million lower-income earners as of January 1, 2019. With this tax relief, a person who works full-time at minimum wage (earning nearly $30,000) will pay no Ontario Personal Income Tax. Low-income workers, including those earning minimum wage, will be able to claim the LIFT Credit when they file their 2019 and subsequent tax returns. Additional details on the LIFT Credit are provided in the Annex: Details of Tax Measures. For Jenny and George, the LIFT Credit and the cancellation of the cap-and-trade carbon tax could provide $1,530 in total relief. See Chart 1.13 for more details. With the proposed CARE tax credit, Alice, Raymond, Avery and Jack could benefit by $3,733 in net relief. See Chart 1.14 for more details. The Province is making life easier for parents and families by helping them find more affordable child care and early years options. This is why the government is removing some restrictions on independent child care operators as well as authorized recreational and skill-building programs, such as after school programs for children in full-day kindergarten. These changes will help increase access to child care and early years programs while maintaining high standards and aligning age eligibility rules with kindergarten and camps. By reducing red tape and administrative burden for home-based child care providers, the Province could enable increased access to child care for approximately 4,000 children under two years old. To further support children with developmental disabilities, Ontario will invest in the construction of the Grandview Children’s Centre in Ajax and the Children’s Treatment Centre at the Children’s Hospital of Eastern Ontario (CHEO) campus in Ottawa. This will reduce wait times for services, address capacity issues and optimize program efficiencies by integrating the delivery of rehabilitation services, thereby reducing travel times for families having to visit multiple sites. The government is working to move all 23,000 children off the waitlist within an 18-month period so they have timely access to support. Consistent with the government’s March 21, 2019, announcement, the Province is enhancing previously announced reforms, particularly to ensure all children receive support. This includes expanding eligible services, smoothing the transition for families receiving services, and ensuring all families of children and youth under the age of 18 with a written diagnosis of autism from a qualified professional will now be eligible for a Childhood Budget. The death of a loved one is a difficult time for a family. This is why the government proposes to reduce and simplify the Estate Administration Tax, and to provide more time to file the required information for the tax. While all taxable estates would benefit, these proposed changes would particularly help families with limited financial resources who may not be able to afford professional advice and assistance in complying with the Estate Administration Tax Act, 1998. Ontario has one of the highest tax rates in Canada on large estates. Ontario is proposing to provide an Estate Administration Tax cut for all taxable estates. Effective January 1, 2020, the Estate Administration Tax would be eliminated for taxable estates with assets of $50,000 or less, and would be reduced by $250 for larger taxable estates. In 2020, there will be an estimated 30,000 taxable estates. With these proposed changes, about 2,500 of these estates would be exempt from paying Estate Administration Tax. The tax burden on all other estates that pay the tax would also be reduced, providing an average tax cut across all taxable estates of about 20 per cent. See the Annex: Details of Tax Measures for more information. Cutting red tape is a priority for this government. Ontario intends to reduce the compliance burden of the Estate Administration Tax by extending the deadlines for filing information returns and other related reporting requirements. Since the previous government’s changes in 2015, estate representatives have been required to file an Estate Administration Tax Information Return after receiving an estate certificate. The Information Return must be filed with the Ontario Ministry of Finance within 90 calendar days after an estate certificate is issued. To reduce the compliance burden on families, Ontario intends to extend the deadline for filing Information Returns with the Ministry of Finance from 90 days to 180 days. In some circumstances, the estate representative must also file an amended Information Return (for example, if they become aware that earlier valuations provided on an Information Return were not correct). Ontario also intends to extend the deadline for filing amended Information Returns from 30 days to 60 days. The government proposes that these changes would take effect January 1, 2020. The fiscal impact of these measures is expected to be about $10 million annually. In addition, the government will explore options to provide further Estate Administration Tax relief, including additional tax relief in respect of charitable donations. The Estate Administration Tax is paid by estate representatives on behalf of taxable estates. Chart 1.15 shows three illustrative examples of tax relief provided through this proposed tax cut. Every part of the government’s plan to end hallway health care and build a modern, sustainable, and integrated health care system, starts with the patient. Today, the system is disconnected, leaving it up to patients and families to figure it out on their own. This fragmented approach to care is failing Ontario’s families and, in particular, seniors. 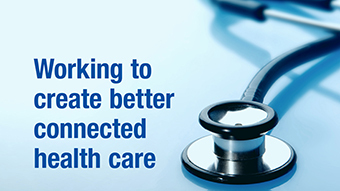 Together, the Province will create a connected system of care where every Ontarian is truly supported throughout their health care journey. The centre of the health care system must be Ontario’s patients, who deserve a seamless health care experience regardless of who is treating them or where the treatment occurs. For too long, the health care system has lacked fundamental accountability for how health care dollars are spent. Every health care dollar diverted unnecessarily from patient services is a dollar being wasted. To continue with its efforts to end hallway health care, the government is moving forward with changes to health care delivery in Ontario by making the system easier to navigate and shifting health care dollars from the bureaucracy to front-line care. Moving towards an integrated health care delivery model, Ontario Health Teams will improve transitions in care and reduce waitlists for services. With the Province’s support and guidance, these Ontario Health Teams will organize care delivery according to the needs of their local communities, thereby allowing groups of health care providers, such as hospitals, physicians, mental health professionals, and home and community care providers, to coordinate the care requirements in their area as a single team of providers. Early adopters will be announced in summer 2019, and provincewide implementation is expected in 2020. To coordinate health care delivery oversight, reduce health care bureaucracy and regional administration silos even further, the government will continue the process of consolidating six existing Provincial health agencies and the costly and duplicative Local Health Integration Networks (LHINs) into a new, single agency. The new agency, Ontario Health, will strengthen what’s working by bringing resources together to assess ideas and successes that can be used to improve other programs and care for patients. Create a centralized procurement system to better manage the purchasing of products and devices for hospitals, home and community care, and long-term care. Through an integrated health sector supply chain that builds on current, successful models, the inconsistent fragmented system will be transformed into a coordinated one, aligned under the oversight of a single authority — Ontario Health. Through these efforts, the government is prioritizing patients over processes and directing more health care spending to where it is needed the most: to the front line for care that is better coordinated, now and in the future. The government is proposing amendments to the Public Sector Labour Relations Transition Act, 1997 (PSLRTA), in an effort to cut hospital wait times and end hallway health care in the province. If passed, the legislation would provide labour relations certainty to workers and employers during a time of transformation. The amendments will assist the Ministry of Health and Long-Term Care in providing efficient delivery of health services and a system that facilitates effective, quality care for the people of Ontario. Difficulties in navigating the health care system and long wait times that are having a negative impact on patients’ health and on family, provider and caregiver well-being. Capacity pressures to meet demand in the health care system already exist, while the appropriate mix of services, beds and digital tools needed for the expected increase in complex-care needs is not available. More effective coordination at the system level and at the point of care would make the system more efficient and achieve better value for taxpayer money. The Province has also been exploring innovative approaches to add much-needed capacity as well as community and long-term care supports as quickly and as efficiently as possible to ensure that patients have a place to go when they are ready to leave the hospital. At the same time, critical decisions have been made, and will continue to be required, to help address hallway health care. This urgent action helped communities prepare for last winter’s flu season and reduced the strain on the health care system by creating new capacity, as well as enhancing existing capacity in high priority areas both in hospitals and in the community, particularly in communities experiencing high rates of unconventional bed use. The government will invest an additional $384 million in the hospital sector as part of its efforts to end hallway health care by maintaining critical hospital capacity, increasing access to highly specialized and innovative treatments, and supporting volume growth. To further support ending hallway health care and provide those living at home with additional supports and services, the government is investing $267 million in additional funding for home and community care. This will include investments focused on increasing front-line care delivery, such as personal support services, nursing, therapy and other professional services at home and in the community. Investments will also provide community supports such as meals and transportation, assisted living services in supportive housing, services for people with an acquired brain injury and services for Indigenous peoples and Francophones. Increasing access to support in the community is expected to enable more people to get care when and where they need it. As the population grows and ages, expanded home and community care is also expected to reduce waitlists for long-term care and decrease pressures on hospitals, thereby alleviating hallway health care. It is critical that the federal government adequately supports the needs of provinces without adding costs. Federal support for health care is particularly important for provinces as the population ages and as the demand for health services increases. However, the federal government has limited its financial contribution to the provincial health care systems at a time when the provinces are facing increased cost pressures. According to the Parliamentary Budget Officer, federal health transfers are expected to decline significantly over time as a share of provincial health spending. The Province is addressing the challenges in the health care system to ensure it is focused on helping patients, but the federal government needs to provide adequate support for health care to ensure the sustainability of provincial health care systems, without adding additional costs or administrative burdens for the provinces. An important step in addressing critical system capacity issues is building partnerships between hospitals, the community and long-term care sectors to support transitional care. By creating transitional care spaces, patients can move from a hospital bed to a transitional care bed in the community (such as a retirement home) to receive appropriate care until they are ready to return home or move into the right setting. This will ensure care is closely integrated and, at the same time, reduce the pressures on hospitals. Part of the government’s vision to end hallway health care is to support innovative partnerships between hospitals and other sectors to provide transitional models of care. Organizations such as St. Joseph’s Healthcare in Hamilton and Durham Region’s Lakeridge Health are both piloting models that can be used as best practices across the province. St. Joseph’s Healthcare Hamilton has been an early leader in connected care through their Integrated Comprehensive Care (ICC) Program, which promotes integrated care to allow for seamless transitions and ease patients from hospital to home. Patients returned home sooner, resulting in a decrease in return visits to emergency departments. Lakeridge Health in Durham Region has partnered with Carriage House Retirement Residence and St. Elizabeth Health Care to form the Carriage House Reactivation Program. This program provides care and services to individuals, particularly seniors, as they move from the hospital to the next level of care — at home, in the community or in long-term care. 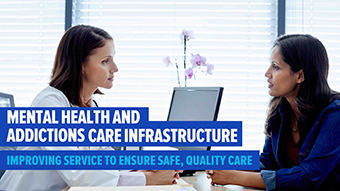 Ontario’s Government for the People is supporting infrastructure investments that will ensure patients and their families have access to the health care they need. This is why the Province is supporting early planning for the redevelopment of the West Lincoln Memorial Hospital in West Niagara. 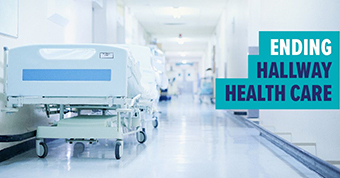 The government is moving forward quickly to address challenges facing the health care system by developing a long-term health care strategy that focuses resources on patient needs to end hallway health care. As this important work continues, the Province will provide approximately $17 billion in capital grants over the next 10 years to modernize and increase capacity at hospitals, and address urgent issues. Health capital investment is a critical component of the government’s strategy to end hallway health care. 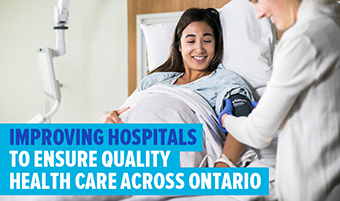 Investing in new facilities to expand services and ensuring existing facilities are maintained in a state of good repair will ensure that the people of Ontario have access to care when and where they need it. Across the province, approximately 60 major hospital projects are currently under construction or in various stages of planning. The government is committed to working with hospitals to implement these projects to meet local health system needs. A larger and well-functioning long-term care sector is a crucial part of the government’s priority to end hallway health care. The challenge is to provide high-quality care to a growing aging population while building additional capacity. Today, too many patients are kept in hospital while waiting for space in a long-term care home. The creation of 15,000 new long-term care beds over the next five years will help the government address hallway health care and move patients to a more comfortable care setting. This capacity would be in addition to the existing 78,500 beds in the system. Furthermore, the government is committed to upgrading an additional 15,000 older long-term care beds to modern design standards, which will allow the long-term care sector to provide more appropriate care to those with complex health conditions. These measures represent a total investment of approximately $1.75 billion in additional funding over five years. To support this commitment to new long-term care beds, in addition to the over 6,000 new beds previously allocated, the government is moving forward immediately with the allocation of an additional 1,157 new long-term care beds through 16 projects across the province. Less than a year into its mandate, the government has announced over 7,200 beds — almost half of its 15,000 commitment. Over the coming months, additional proposals for new long-term care beds will be evaluated and new beds will be allocated in locations where services are most needed now and will be in the future, and to projects that will offer specialized services to meet the complex needs of people who may be waiting in a hospital for more appropriate care. As well, the government will be making it easier to find land for new long-term care home developments. The government’s efforts to reduce red tape and streamline processes to sell buildings and properties means that these properties will be more easily evaluated prior to sale to determine if they can be used for long-term care spaces. This is just another way the government is making better use of surplus government properties and land. The future of health care in Ontario will include modern long-term care homes in which residents can expect to receive the care they deserve and live in a dignified, home-like environment. Ontario currently has 35 public health units across the province delivering programs and services, including monitoring and population health assessments, emergency management and the prevention of injuries. Funding for public health units is shared between the Province and the municipalities. However, the current structure of Ontario’s public health units does not allow for consistent service delivery, could be better coordinated with the broader system and better aligned with current government priorities. This is why Ontario’s Government for the People is modernizing the way public health units are organized, allowing for a focus on Ontario’s residents, broader municipal engagement, more efficient service delivery, better alignment with the health care system, and more effective staff recruitment and retention to improve public health promotion and prevention. Streamline the Ontario Agency for Health Protection and Promotion to enable greater flexibility with respect to non-critical standards based on community priorities. Protect what matters most by ensuring public health agencies focus their efforts on providing better, more efficient front-line care by removing back-office inefficiencies through digitizing and streamlining processes. The government values the significant contribution of Ontario’s doctors in providing safe, effective and quality care to individuals and families across the province. For the first time in years, the government has a strengthened relationship with Ontario’s physicians. The government has made it a primary objective to reset the relationship with Ontario’s doctors in a way that respects physicians while balancing the need to provide patients with the care they deserve and sustaining Ontario’s public health care system. Given that physicians are at the forefront of patient care and delivery, the government respects the recently arbitrated decision on a new physician services agreement. This is a positive step forward. The government is committed to a renewed and productive working relationship with the Ontario Medical Association and Ontario's doctors. Ontario’s Government for the People is committed to focusing benefits on those who need them the most. The government will continue its work to examine the Ontario Drug Benefit Program, with the objective of creating a sustainable drug system. Ontario’s Government for the People is already making changes to the way benefits are delivered to focus on those who need them the most. Effective April 1, 2019, children and youth under the age of 25 who are not covered by private plans will continue to receive coverage for eligible prescription medications from the government; children and youth who are covered by private insurance will bill those plans. This plan remains affordable while ensuring children and youth will continue to receive the prescription drugs they need. Reducing the administrative burden for clinicians and red tape for the industry wherever possible. Too often people visit a health professional, such as a pharmacist, to treat a known illness such as pink eye, only to be referred to another health professional such as a physician, for a diagnosis and prescribed treatment, only to return to the pharmacy to fill the prescription, rather than receive the necessary treatment immediately on the initial visit. To support the government’s vision for a health care system that enhances access to services and the patient experience, the government will enable regulated health professionals to use their education and training more effectively by expanding the scope of practice for certain regulated health professionals, such as pharmacists, nurse practitioners, dental specialists and optometrists. This is a basic change that can save time and money, and get you healthier quicker. By reducing regulatory barriers to accessing up-to-date drug therapies, for example, health care providers will have more treatment options for their patients, thereby alleviating the need to make referrals to other providers, who can then focus their time and attention on patients with more serious and/or complex conditions. The mental health and addictions system in Ontario has been challenged for too long by extensive wait times, barriers to access, inconsistent quality, a lack of standardized data and widespread fragmentation. This was confirmed during the government’s provincewide consultations with experts, providers, and people with lived experience. That is why Ontario’s Government for the People is committed to investing $3.8 billion for mental health, addictions and housing supports over 10 years to address these issues, beginning with building a mental health and addictions system focused on core services embedded in a stepped-care model, and a robust data and measurement framework. Investments of $174 million in 2019–20 will support community mental health and addictions services, mental health and justice services, supportive housing, and acute mental health inpatient beds. Services will also target priority populations, such as Indigenous peoples and Francophones. The government will be building on its investments in mental health and addictions services by increasing capacity through projects such as the Sunnybrook Health Sciences Centre’s Hurvitz Brain Sciences Centre. This project will be important for treatment and innovation in caring for the full range of brain disorders, including mental illness and addictions, as well as dementia and neurodegenerative disorders, in an environment that allows for more effective care delivery for patients. Projects such as this one will provide important mental health and addictions services with a focus on ambulatory care and community outreach, enabling care providers to deliver services to patients across the province. The government is working to ensure the health care system is sustainable and accessible for all patients and families. Demand for ambulance services continues to grow in Ontario, with over 1.1 million patient transports taking place each year. In partnership with the municipal sector, the government continues to support the delivery of critical front-line health services with a combined investment of $1.5 billion in emergency health services. The number of calls for emergency medical services has grown by almost 3.5 per cent each year, while costs have grown at six per cent annually. To support the critical work of emergency health first responders, the government is continuing to invest in supports for mental health and in reducing the time it takes to deliver patients to busy emergency departments. In addition, the government is exploring new models of care and delivery for emergency health services to improve care for patients and reduce duplication. The government continues to support emergency health first responders suffering from post-traumatic stress disorder (PTSD). This disorder can affect paramedics and ambulance communications officers in Ontario who provide compassionate, life-saving care 24 hours a day, 7 days a week, 365 days a year in every corner of the province. Under the Supporting Ontario’s First Responders Act, a PTSD diagnosis for certain workers is now presumed to be work-related — they no longer need to prove it. This includes first responders, including police officers and correctional officers, youth service workers, emergency dispatchers and others, and gives these workers faster access to Workplace Safety and Insurance Board (WSIB) benefits, resources and timely treatment. Select 911 medical emergency patients who are transported to emergency departments may be more appropriately treated in other health care settings. The government will be exploring how to support better care for patients in places other than the emergency department and ensure patient safety. The government will also look at how to ensure more of its investment in emergency health services is going towards direct services for patients. Police officers, firefighters, correctional officers, probation and parole officers, Crown attorneys, nurses and other justice sector workers have incredibly difficult jobs and come face to face with difficult situations. The Member of Provincial Parliament (MPP) for Brantford-Brant, Will Bouma, has been a leader in raising awareness to dispel the stigma around this important issue. As such, the government proposes to adopt his measure, proclaiming June 27 of each year as PTSD Awareness Day. Ensuring all remaining “red and white” health cards are converted to more secure photo health cards. Land ambulance dispatch centres: The government will streamline the way land ambulance dispatch services are delivered by better integrating Ontario’s 59 emergency health services operators and 22 dispatch centres. The government will continue to support first responders by providing the right tools to ensure the right responders get to the right place with the right information at the right time, and by integrating emergency health services into Ontario’s health care system. Home oxygen under the Assistive Devices Program: The government will implement more competitive pricing for home oxygen rates that would result in a reduction of about 17 per cent in price, with savings going to eligible clients who pay a 25 per cent co-payment. Individuals on social assistance would continue to receive benefits at no cost. Changes to pharmacy payments: The government is considering moving to implement changes to the way pharmacies are paid by the Ontario Drug Benefit Program, including fees paid for filling prescriptions for long-term care home residents. Faced with an aging population, individual doctors, nurses, pharmacists and other health care professionals need to be prepared to provide a health care system that is singularly focused on helping them help patients. Ontario’s vision is to help seniors remain independent, healthy, active, safe and socially connected. At least two-thirds of low-income seniors do not have access to dental insurance. As a result, untreated oral health issues, such as infection, pain and abscesses, can lead to chronic disease and a lower quality of life. As well, the rates of dental decay, gum disease and oral cancer are higher among seniors — the longer oral health care is delayed, the more costly and painful treatment will become. Untreated oral health issues represent a significant burden on the health care system and contribute to hospital overcrowding. In 2015, there were almost 61,000 hospital emergency visits for dental problems, at a cost to Ontario’s health care system of approximately $31 million. That is why the government is moving forward with its commitment to introduce a new dental program for low-income Ontario seniors with an annual investment of approximately $90 million when fully implemented. By late summer 2019, single seniors age 65 and older with incomes of $19,300 or less (or senior couples with combined incomes of less than $32,300) and without existing dental benefits, will be able to receive dental services in public health units, community health centres and Aboriginal Health Access Centres located throughout the province. By this coming winter, this program will be expanded by investing in new dental services in underserviced areas, including through mobile dental buses and an increased number of dental suites in public health units. The government’s new publicly funded dental care program for low-income seniors will help reduce unnecessary trips to the hospital, prevent chronic disease and increase quality of life for Ontario’s seniors. In Ontario, seniors are the fastest growing demographic, with the number increasing by 100,000 every year. In 2023, there will be 3 million seniors in Ontario, up from 2.3 million in 2017. The vast majority of seniors want to live independently in their own homes and communities, and where they can be active for as long as they are able. However, to do this, seniors require stronger supports to help them live safely and securely. That is why the Province will be developing a new cross-government strategy to improve the lives of seniors and provide the supports and resources to help them live independently, ensure their safety and security, connect them to the community and help them achieve greater financial security and social connections. Approximately one in four people in Ontario age 15 years and over has a disability, a number that increases to 43 per cent among seniors. Disabilities can range from flexibility and mobility to vision and hearing. As the population continues to age, the numbers are expected to rise in terms of frequency and seriousness. Ontario’s Government for the People will work to ensure people with disabilities have the support and resources they need to live fulfilling and productive lives. The built environment continues to be a challenge for people with disabilities and seniors. This is why the government will partner with the Rick Hansen Foundation to launch the Rick Hansen Foundation Accessibility CertificationTM program in select communities across the province. With a $1.3 million investment over two years, this program will prepare accessibility assessments of businesses and public buildings and, together with property managers and owners, determine ways to remove any identified barriers for people with visible and invisible disabilities. Getting back to basics, respecting parents and working with teachers to ensure children have the skills they need to succeed — an education system that is truly built for families. The government is strengthening its world-class education system in Ontario, with particular emphasis on math, science and financial literacy as well as skilled trades, to support future scientists, engineers, doctors and tradespeople. This will also ensure that the needs, interests and strengths of all students are fulfilled to successfully prepare them for graduation, community and beyond. The government is moving forward with an education curriculum that respects the wishes of parents while teaching students the skills they need to find rewarding careers in the modern economy. The government is also challenging the province’s schools and school boards to focus resources on the needs of students. Ontario’s Government for the People is improving accountability and making efficient and effective use of taxpayers’ dollars. The government is looking to partners in the education sector to find efficiencies and improve accountability, to ensure that funding is targeted and to improve the in-class experience and education outcomes for students. For example, the Province has cancelled previously planned increases to school trustees’ honorarium. The Province is listening to parents and consulting with education partners to improve Ontario’s education system, from kindergarten to Grade 12, while building a more sustainable path forward. The Province is committed to supporting and enhancing student educational outcomes while also improving efficiency and accountability with respect to education funding. These long-term reforms will improve the sustainability and effectiveness of Ontario’s education system. Since the fall of 2018, the Province has been consulting with its education partners and with parents on its plan to modernize classrooms and education funding, as well as consulting on class sizes and hiring practices for teachers. Most recently, in March 2019, the Province released two consultation guides on class sizes in Grades 1 to 12 and hiring practices. The prior consultations, as well as the most recent round of consultations, will help shape the government’s education plan. The government agrees with its sector partners that it is important to protect class sizes in the early grades. This is why the government’s education plan keeps hard class size caps in place from kindergarten to Grade 3. For older students, the government proposes to require all school boards to maintain an average class size of 24.5 in Grades 4 to 8, representing an average increase of one student per class. For the oldest students in Grades 9 to 12, the government’s plan would require school boards to maintain average class sizes of 28. This aligns with the class size requirements in other Canadian provinces while also helping prepare older students for classroom environments in postsecondary institutions. The government will continue to consult with education stakeholders, including its labour partners, on this plan. These consultations will close at the end of May 2019. The government’s objective is to work with its education partners to improve teacher mobility while increasing transparency, fairness, consistency and accountability in teacher hiring across all school boards. Ontario’s students deserve the best teacher available in each and every classroom, and principals should be empowered to hire teachers based on merit and fit for role. Apply to all the school systems, including the French-language school boards. The Province is committed to supporting Indigenous student achievement and well-being. Improving access to education for Indigenous students is part of the government’s plan to create jobs, grow the economy and support the people of Ontario in their everyday lives. To support Indigenous student retention and graduation rates, the Province will invest an additional $3.7 million in 2019–20 to fund a revised First Nations, Métis and Inuit studies curriculum for Grades 9-12 and the Indigenous Graduation Coach Program in targeted district school boards across the province. Indigenous graduation coaches have deeply rooted experiential ties to the Indigenous communities and their cultures, act as mentors and advisors to students, and facilitate access and referrals to academic supports and community resources to promote Indigenous student wellness and academic achievement. Evidence shows that the Indigenous graduation coach model has a tangible impact on student success and overall well-being, including increasing the graduation and enrolment rates of Indigenous students. For example, the graduation rate of Indigenous students attending Dryden High School in the Keewatin-Patricia District School Board increased from 39 per cent to 80 per cent, and the dropout rate for Grade 9 decreased from 16 per cent to 2 per cent, with the Indigenous graduation coach model. Establishing foundational skills and interests for students to participate in physical activity leads to lifelong engagement and well-being. Research shows that students would benefit from more opportunities for physical activity. To help meet the needs of a broader range of students, the Province will invest more than $0.5 million over three years to increase opportunities for students to participate in physical activities, such as cricket, at school. This funding would provide seed funding to school boards and third-party organizations to promote cricket as an opportunity to meet the diverse needs and interests of students. 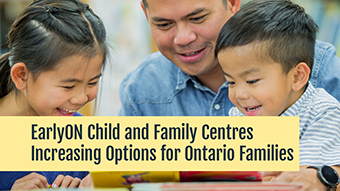 Upon assuming office, Ontario’s Government for the People took immediate steps to initiate a broad-ranging curriculum consultation to which all the people of Ontario, in particular, all Ontario parents, were invited to participate. Consultations ran from September to December 2018, during which time the government received over 72,000 submissions which included the participation of parents, students, educators, employers and organizations from across Ontario. This was the largest education consultation in Ontario’s history. Developing the first-ever Ministry of Education Parents’ Bill of Rights. Ontario’s Government for the People has conducted the largest consultation on education in the province’s history. The consultation included more than 72,000 engagements across three different consultation channels, including an open submission form, an online survey and telephone town hall meetings held in every region of the province. The number of engagements in these consultations increased 11-fold compared with that of the previous 2014 Health and Physical Education curriculum consultations. The majority of respondents felt that the current education system is doing a poor or very poor job of teaching financial literacy and expressed support for experiential learning to improve job skills and student performance in Science, Technology, Engineering and Math (STEM). Respondents also expressed support for some form of restriction on cellphones in schools; that it is important that parents play an active role in the education system and have open communication with schools and boards; and that the Health and Physical Education curriculum should address topics in an age-appropriate manner. To ensure that the rights of parents are respected, the Province will begin drafting a Ministry of Education Parents’ Bill of Rights. Designed to improve communication with parents, Ontario would be the first province in Canada to have a dedicated Parents’ Bill of Rights. As part of the provincewide consultation, parents were asked what elements they wanted to see included in the Parents’ Bill of Rights. Respondents expressed it is important that parents play an active role in the education system and have open communication with schools and school boards. Parents also suggested that the Bill should include parents’ rights to withdraw their children from lessons, classes and schools that are teaching content they do not agree with, and allow parents to express an opinion about what their child is being taught in the classroom, especially with respect to health and physical education. The government is committed to ensuring that every dollar spent in the classroom is having the greatest impact on student achievement. This involves looking at all aspects of the education system, including school board operations, while respecting the four publicly funded education systems in Ontario. The Ministry of Education will be undertaking a thorough review of how boards can conduct their operations in the most efficient manner to best serve students and parents while ensuring their long-term sustainability. This process will be kicked off by the creation of a minister’s task force. The government looks forward to engaging with experts and education partners in this important conversation. The government is committed to restoring proven methods of teaching to ensure Ontario students have the skills they need to succeed. The Province will revise the Ontario curriculum based on research and feedback from the public consultations. The government is following through on its commitment to respect parents, teachers and students, and it will work with the Education Quality and Accountability Office (EQAO) to implement a better approach to standardized testing. The EQAO was established as a Crown agency through the Education Quality and Accountability Office Act, 1996. The EQAO assessments are developed to align with the Ontario curriculum and evaluate students’ achievements in reading, writing and mathematics at key points in their learning to ensure that all students are being assessed according to a common provincial standard. Numeracy is an important skill for succeeding in the classroom, the workforce and everyday life. Mathematics scores of Ontario elementary students have been steadily declining over the last 10 years, as many students struggle to meet the minimum provincial standard. Results from the EQAO show that, between the 2008–09 and 2017–18 school years, the percentage of students who met the provincial standard in mathematics fell from 70 per cent to 61 per cent among students in Grade 3, and from 63 per cent to 49 per cent among students in Grade 6. This is why the government will implement a new four-year mathematics strategy to ensure that students have a strong understanding of the fundamentals. Offering supports to parents and access to student learning opportunities outside of the school day, including summer learning and tutoring by third parties. Financial and economic literacy is an important skill that enables citizens to understand how to manage their money, and how to invest it now and throughout their lives.2 It is important for young people to have the right skills to make informed financial and economic decisions to succeed both inside and outside the classroom. This can apply to everyday decisions such as buying groceries, and to bigger investments such as paying for tuition or buying a car. Data from the recent public consultations on education reform indicate that Ontario’s education system is not doing enough to provide students with important job and life skills, such as financial literacy. This is why the Province is enhancing the mathematics curriculum and the Grade 10 Career Studies course to better equip students with the knowledge and skills they need to make responsible economic and financial decisions. Data from the recent public consultations on education indicate that Ontario’s education system is not doing enough to provide students with important job and life skills, such as financial literacy. Of the more than 19,000 respondents to the online survey, 57 per cent indicated that the education system was doing a “poor” or “very poor” job of teaching students about understanding savings and investing. Better buildings support better learning for Ontario students. This is why the Province is investing almost $13 billion in capital grants over a 10-year period to help build new schools in high-growth areas and improve the condition of existing schools. This will include an investment of $1.4 billion in school renewal in the 2019–20 school year, which will result in critical improvements that help ensure student safety. Ensuring the safety and security of the people is the government’s most fundamental responsibility. The people of Ontario owe a debt of gratitude to the heroes on the front lines — including police, firefighters and correctional service staff. 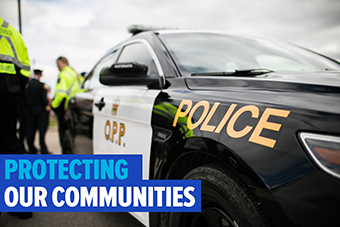 Their efforts protect the province’s families and keep its communities safe. These heroes have back of the people of Ontario, and the government has theirs. The people of Ontario have a right to feel safe at home and in their communities. The government firmly believes that protecting individuals and families is one of its fundamental responsibilities. This is why it is prioritizing changes to the justice sector to ensure an integrated, efficient and sustainable criminal justice system that holds criminals accountable for their actions, puts the victim at the centre of the justice system and protects people from all walks of life. This includes ensuring the safety and security of the people of Ontario through justice sector modernization, effective crime prevention, police oversight and strong enforcement of the laws regarding cannabis sales and illegal cannabis dispensaries. Developing justice centres that will integrate justice, health, education, housing and social services to collectively address the complex intersection of risk factors that drive gun- and gang-related violence in Ontario. Allowing the Ontario Judicial Council and Justices of the Peace Review Council to publish their annual reports on their websites after submitting them to the Attorney General. Every day, the brave men and women of Ontario’s police services dedicate themselves to keeping families and communities safe. Sometimes this requires police officers to put themselves in harm’s way. Occasionally, this requires that they respond to a crisis and make difficult, life-or-death decisions in the blink of an eye. Yet, no matter what, the people of Ontario can count on these brave men and women in uniform to protect them. Improve police oversight by ensuring that law enforcement bodies meet reasonable standards of transparency and accountability. By treating police officers with respect, the government is strengthening the relationship between the police and the public they serve. The end result will be a safer Ontario for everyone. People need to feel safe in their homes and communities. Yet, in too many neighbourhoods and in too many cities across the province, the fear of gun-and gang-related violence looms large, leaving families terrified and isolated. This is why fighting gun and gang violence, which threatens the safety of families and neighbourhoods, requires urgent action and remains one of the key priorities of Ontario’s Government for the People. Ontario has already committed $25 million in new funding to fight guns and gangs in the City of Toronto over four years to provide it with additional digital, investigative and analytical resources to fight drug gangs and gun criminals and to establish intensive firearm bail teams in each of Toronto’s courthouses. The government recognizes that other Ontario cities, such as Ottawa, are also experiencing increased gun violence. This is why the Province is providing the Ottawa Police Service with $2 million this year to support initiatives to combat gun-and gang-related crime in its community. Protecting the most vulnerable people with the highest risk of experiencing gun and gang violence and victimization — including Indigenous women and youth, as well as rural and racialized youth — through various initiatives aimed at keeping at-risk youth in school and preventing vulnerable people from being recruited by gangs. 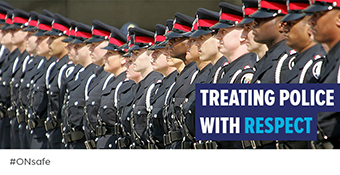 Replacing aging facilities with new Ontario Provincial Police (OPP) detachments. These investments will ensure that communities can continue to receive modern, cost-effective and high-quality police services that are essential to public safety. Many households across the province have a pet, and these pets are a part of family life. The government recognizes the importance of animal welfare for small animals and livestock. Ontario’s Government for the People is actively reviewing existing legislation to ensure appropriate measures are in place to provide animals and their owners with the protections they deserve and the people of Ontario expect. The Province has already begun conversations with stakeholders and will continue seeking ideas and input. The goal is an approach that respects the rights of the people of Ontario and ultimately improves the animal welfare system across the province. A common challenge currently facing Ontario and other provinces since cannabis was legalized in Canada on October 17, 2018, is a national cannabis supply shortage brought on by the federal government’s mismanagement. By choosing to throw open the doors to cannabis legalization without first taking into account the reliability and sustainability of the national cannabis supply, the federal government is failing to curb the growth of the illegal cannabis market while also creating widespread business uncertainty for the people and businesses seeking to make a living in this new industry. Ontario moved forward with rules aimed at keeping cannabis out of the hands of children and youth, keeping roads safe and combatting the illegal market. The government opted to pursue a private retail model instead of the previous administration’s government-owned approach. This will allow businesses of all sizes to participate and compete in an open market system and provide consumers with greater choice, convenience and lower prices. Since legalization, people across the province have been able to purchase recreational cannabis online through the Ontario Cannabis Store’s retail website. The Ontario Cannabis Store (OCS) is the exclusive wholesaler to private retailers, and these stores are being tightly regulated by the Alcohol and Gaming Commission of Ontario (AGCO). Retail stores authorized by the AGCO are required to display the cannabis retail seal so that consumers can be confident they are buying quality products from a legal source. In response to the national cannabis supply shortage, the government implemented a temporary cap of up to 25 retail store authorizations. These brick-and-mortar retail cannabis stores were permitted to begin opening on April 1, 2019. However, the government remains committed to moving towards an open allocation of licences where the number of stores is limited only by market demand. To enable the opening of additional licensed stores, the government will develop a process to allow the AGCO to pre-qualify operators that seek to enter the market and participate in future allocations of retail store authorizations. The government is taking a market-oriented approach, which will allow private-sector businesses to build a safe and convenient retail system to combat the illegal market. When Ontario has determined that the federal government has provided for enough reliable supply, it will issue further retail store authorizations, including in municipalities with a population of less than 50,000 and in First Nation communities. The federal government is responsible for licensing enough cannabis production in Canada to displace the illegal market, but there has not been enough supply to date to meet consumer demand. In a letter to the federal Minister of Finance, Ontario called on the federal government to take steps in addressing the national cannabis supply shortage and supply chain issues to ensure that there is an adequate and predictable supply of recreational cannabis from federally licensed producers to meet the objectives of legalization. Ontario also continued to urge the federal government to ensure that First Nation communities have the financial support needed to successfully respond to the federal legalization of cannabis. Ontario’s Government for the People is steadfast in its message: driving high is never acceptable. This is why the Province passed “zero means zero” tolerance measures targeting young, novice and commercial drivers: these drivers must have no presence of alcohol, cannabis or any other drug that impairs driving. 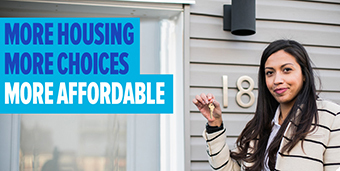 All people of Ontario can find a home that meets their needs and their budget. Ontario will partner with municipalities to ensure that they are working as effectively and efficiently as possible to support the economic prosperity of their residents and businesses. Housing is one of the largest costs facing Ontario families and a cost that has risen sharply in most areas of the province in recent years. This, in part, reflects an inadequate supply of housing in the province. Demand for housing in Ontario, particularly in the Greater Toronto and Hamilton Area, has been strong in recent years, while housing supply has been less responsive than in the past. This has contributed to higher resale house prices and rents. In the 2018 Ontario Economic Outlook and Fiscal Review, the government announced policies to increase the supply of housing in the province. This included the reintroduction of the rent control exemption for new units, which will help incent new unit development. The government also committed to delivering a Housing Supply Action Plan and to introducing legislation by spring 2019. The Ontario government has been taking the lead in addressing affordability issues without waiting for further studies or expert panels. Ontario’s Government for the People has concluded an online consultation to gather ideas on creating more affordable and good-quality places to live. Over 85 per cent of the more than 2,000 submissions received through the online consultation came from the general public. More than half said their top criteria when looking for a home were affordability, followed by transit, schools and services located nearby. Cost: development costs are too high because of high land prices and government-imposed fees and charges. The Housing Supply Action Plan will also support the reduction of red tape, making it easier to live and do business in Ontario. In addition, the plan will help support the residential construction industry, which is a major source of employment in Ontario and an important part of the province’s economy. A stable housing market with sufficient supply will also help attract new investment to Ontario. Ontario’s community housing system has complex rules and red tape that make it difficult for people to find affordable housing that suits their unique needs. Through the Community Housing Renewal Strategy, the government will stabilize and grow Ontario’s community housing sector, making it more efficient, sustainable and easier to navigate for the people of Ontario and community housing providers. This Strategy, along with the Housing Supply Action Plan, will help the people of Ontario find a home that meets their needs and their budget. Addressing community safety concerns especially for the most vulnerable, including seniors and children. Ontario is also supporting affordable housing through the National Housing Strategy. The National Housing Strategy bilateral agreement between the federal government and the Province of Ontario will provide approximately $4 billion in federal and provincial funding for the Ontario housing sector over the next nine years. Programs under the National Housing Strategy, such as the Canada-Ontario Community Housing Initiative and the Ontario Priorities Housing Initiative will leverage federal, municipal and provincial funding to protect affordability for individuals and families in social housing, and support repair and renewal of existing supply as well as expand supply. Under the National Housing Strategy, the Province will also be negotiating and co-designing the Canada-Ontario Housing Benefit with the Canada Mortgage and Housing Corporation to create a housing benefit that would address housing affordability. Supportive housing helps people with complex needs maintain stable housing and have an overall better quality of life. Ontario has more than 20 supportive housing programs assisting more than 90,000 people with a wide range of support needs. This includes Indigenous people, those with mental health issues, developmental and physical disabilities or people who have experienced homelessness. The Province’s current supportive housing system is difficult for people to navigate and does not effectively address the unique needs of individuals. To improve the flexibility of the system and the outcomes for people, the government will undertake a comprehensive review to identify opportunities to streamline and improve coordination of the Province’s supportive housing programs. This is an important step to ensure that the Province provides quality supportive housing with a focus on the needs and outcomes of clients, which can also help reduce cost pressures on other services, such as the health care and the justice systems. Promoting the accuracy, transparency and stability of the property tax system, which is the main source of revenue for municipalities. The Province is working with municipalities to help them find efficiencies in the way that local services are delivered to residents. The Province provided $200 million to support the modernization efforts of 405 small and rural municipalities so that these communities can achieve efficiencies. This can enable important modernization efforts, such as information technology solutions, service delivery reviews and the development of shared services agreements, all of which would help reduce future municipal costs and achieve value for money. This government recognizes municipalities as responsible and accountable governments with respect to matters within their jurisdiction. Every day, municipal governments make decisions and deliver services that impact the lives of families and businesses throughout Ontario. Indeed, they are often the level of government closest to the day-to-day lives of Ontario families. This is why the government is taking meaningful action to support municipalities in a sustainable and responsible way. Launched a review of the municipal reporting burden to ensure that only necessary information is collected. The line-by-line review of Ontario’s spending conducted by EY Canada found that growth in transfer payments has been unsustainable. As recommended in EY Canada’s report entitled Managing Transformation — A Modernization Action Plan for Ontario, the government is committed to driving greater efficiencies and value for money, thereby protecting services for the future. This commitment will also be required from all partners, including municipalities. The people of Ontario are counting on all governments to work together to make life better for their communities. Municipalities have said that the Province asks for too many reports, which in turn impacts their ability to focus on local priorities. The municipal sector has estimated that the Province collects at least 422 reports from municipalities each year. To tackle this burden, the Province is reviewing current reporting to ensure that only necessary information is collected and that the reporting respects the ability of smaller municipalities to respond. The government is currently working across ministries and with the municipal sector to measurably reduce the municipal reporting burden. The government has appointed Michael Fenn and Ken Seiling as special advisors to meet with the different regions, invite feedback from residents and businesses, and find out what has been working and what might need improvement. They will deliver advice to the Minister of Municipal Affairs and Housing based on their expertise and assessment of the feedback received through the consultation process. A Made-in-Ontario environment plan will help protect the province, ensuring that its pristine beauty and strong communities can be enjoyed now and in the future. This plan strikes the right balance between a healthy environment and a healthy economy by protecting Ontario’s natural resources and reducing greenhouse gas emissions without imposing an ineffective, regressive carbon tax on hard-working Ontario individuals and families. A changing climate is creating new challenges for Ontario. The province’s homes, communities, resources and infrastructure are at risk. Also threatened are food security, road access for remote First Nations and the health of ecosystems. This government is taking action to protect Ontario’s environment as well as its citizens and businesses. 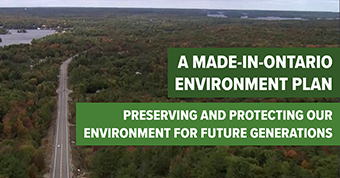 To tackle climate change and other environmental challenges, the government released the Preserving and Protecting Our Environment for Future Generations: A Made-in-Ontario Environment Plan in November 2018. This new plan focuses on protecting Ontario’s air, land and water resources, reducing litter and waste, and lowering greenhouse gas emissions while helping communities adapt to a changing climate. It is a balanced and responsible plan that recognizes Ontario’s unique needs and opportunities. In addition, the plan includes robust transparency measures that will ensure that the people of Ontario have real-time information about monitoring, incidents and enforcement activities. It also affirms the government’s commitment to protecting the environment without burdening Ontario households and businesses with ineffective policies, such as a regressive carbon tax. By ending the cap-and-trade carbon tax, the government has enabled hard-working Ontario individuals and families to save money and businesses to create jobs and remain competitive. To ensure a path forward for balancing emissions reductions and economic growth, the government will focus on smart policy approaches that encourage innovation and reduce regulatory barriers to climate solutions. The federal government must allow each jurisdiction to take its own approach to addressing climate change in Canada. Ontario has demonstrated its commitment to the Pan-Canadian Framework on Clean Growth and Climate Change by reducing emissions by 22 per cent since 2005, while emissions in the rest of Canada increased by 3 per cent over the same time, and by releasing the Preserving and Protecting Our Environment for Future Generations: A Made-in-Ontario Environment Plan. The federal government must respect the principles of the Pan-Canadian Framework on Clean Growth and Climate Change, which states that the provinces and territories should have the flexibility to design their own policies and programs supported by federal investments to meet emissions reduction targets, rather than impose new costs on hard-working Ontario taxpayers and businesses. The government is taking steps to protect air quality through strong environmental standards and local air-quality standards. While the province’s air quality has improved significantly, regions of the province continue to experience air-quality challenges that the government will address in partnership with communities. In addition to introducing other measures, such as redesigning the emissions testing program for heavy-duty trucks, the government will make it easier for the people of Ontario to report the pollution that is impacting their lives through an online platform accompanied by an improved complaint response system. Ontario has been a leader in the efforts to tackle climate change. Compared with 2005, the province’s total greenhouse gas emissions have dropped by 22 per cent — even while the rest of Canada saw emissions increase by three per cent during the same time period. The Province’s proposed target is to reduce its emissions by 30 per cent below 2005 levels by 2030. Smart policies included in the new environment plan put this target within reach. Instead of the job-killing federal carbon tax, the Province would create a $400 million emissions reduction fund. This fund would make it easier for the private sector to implement its best projects and ideas to drive emissions reductions at the lowest cost to taxpayers. It would seek to speed up the deployment of low-carbon solutions and encourage private investment in clean technologies that are commercially viable, and reduce energy costs for ratepayers. This fund could consider investing in cost-effective projects in various sectors, such as transportation, industry, residential, business, and municipal. Reducing emissions is one aspect of this government’s fight against climate change. The effects of a changing climate, such as more frequent extreme weather events, are already underway. To build resilient communities, the government will take steps to develop the information, tools and resources that can help Ontario communities be better prepared for the impacts of climate change. The government is committed to preparing families and communities for the costs and impacts of climate change, such as more frequent severe weather events and flooding, and to protecting Ontario’s natural environment, communities, businesses and municipalities. To improve the understanding of how climate change will impact the province, the government plans to launch Ontario’s first-ever climate change impact assessment — a key part of the government’s Made-in-Ontario Environment Plan. The government will assess the best science and information to better understand where the province is vulnerable and understand which regions and economic sectors are more likely to be impacted. This enhanced understanding will enable the Province, local communities, businesses, Indigenous communities and the public to make planning and investment decisions that are better informed by the likely impacts of a changing climate. This will ensure better long-term management of public and private assets and infrastructure, and reduce costs for governments, businesses and households. Ontario industries have made great strides in lowering their emissions; however, they are still responsible for 29 per cent of the province’s emissions. The government is currently developing emissions performance standards for industries to achieve further greenhouse gas reductions. These made-in-Ontario standards will consider factors such as trade exposure and competitiveness. Instead of an absolute cap on emissions for the province, the proposed approach would set sector-or facility-level greenhouse gas emission performance standards that industrial facilities are required to meet, and tie emissions to the level of output or production from these facilities. Each industrial facility would be required to demonstrate compliance annually. These standards will be tough but fair, cost-effective and flexible. This approach will be similar to that taken in Saskatchewan. The Province expects the federal government to recognize equivalency for made-in-Ontario emission performance standards and to avoid application of the federal system to Ontario industry. 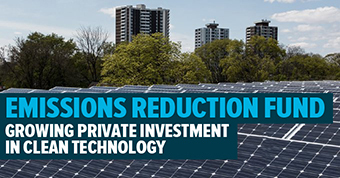 As promised in Preserving and Protecting Our Environment for Future Generations: A Made-in-Ontario Environment Plan, the government has taken steps to encourage private investments in clean technologies. Through the Ontario Job Creation Investment Incentive, the Province is paralleling the federal government in allowing businesses to immediately write off investments made in specified clean energy equipment. This incentive will make investments in clean energy generation and energy conservation equipment more attractive. See Chapter 1, Section D: Open for Business, Open for Jobs for more details. Natural gas vehicles have a smaller carbon footprint compared to vehicles powered by diesel, as stated in the government’s Made-in-Ontario Environment Plan. The government will maintain the tax exemption for natural gas used as a transportation fuel. Knowing that the government intends to maintain the tax exemption under the Gasoline Tax Act will provide certainty to businesses as they consider retrofitting, replacing or expanding their fleets of heavy-duty vehicles. The government recognizes that real environmental leadership does not belong to the social media campaigns of celebrities and activists, and instead rests with real civic-minded action from people right here at home. This is why the government will actively encourage all citizens, but in particular youth, to engage in anti-litter activities that will culminate in Ontario’s first ever provincial day of action to fight litter. In March 2019, the government launched the Reducing Litter and Waste in Our Communities: Discussion Paper and is looking at proposed ways to reduce the amount of waste generated and to divert more waste from landfill. Actions such as developing a proposal to ban food waste from landfill and expanding green bin, or similar collection systems, will help in achieving these goals. To reduce plastic waste and limit microplastics that end up in lakes and rivers, the government will work with other provinces, territories and the federal government to develop a plastics strategy. Conservation of Ontario’s rich biodiversity and natural resources is an important way to mitigate the impact of a changing climate on such areas. The government is improving the resilience of sensitive natural ecosystems, such as wetlands and grassland habitats, through good environmental planning, stewardship and partnerships. The government will work with Indigenous organizations, the forestry industry and communities in supporting sustainable forest management, which can help reduce emissions and increase carbon storage in forests and harvested wood products. As Ontario’s water resources are facing many pressures from climate change, population growth and aging infrastructure, there is a greater need to increase transparency through real-time reporting of sewage overflows from municipal wastewater systems. The government is looking to increase transparency through real-time monitoring of sewage overflows from municipal wastewater systems into Ontario’s lakes and rivers. It will work with municipalities to ensure that proper monitoring occurs and that the public is aware of the overflow incidents. The government is also looking into updating policies related to municipal wastewater and stormwater to make them easier to understand. Making the process for listing species on the Species at Risk in Ontario Listmore transparent. Improving municipal wastewater and stormwater management and reporting. Ontario will explore opportunities to work with the federal government to protect water quality and ecosystems of the Great Lakes. This figure provides an example of how the government is putting more money in people’s pockets. 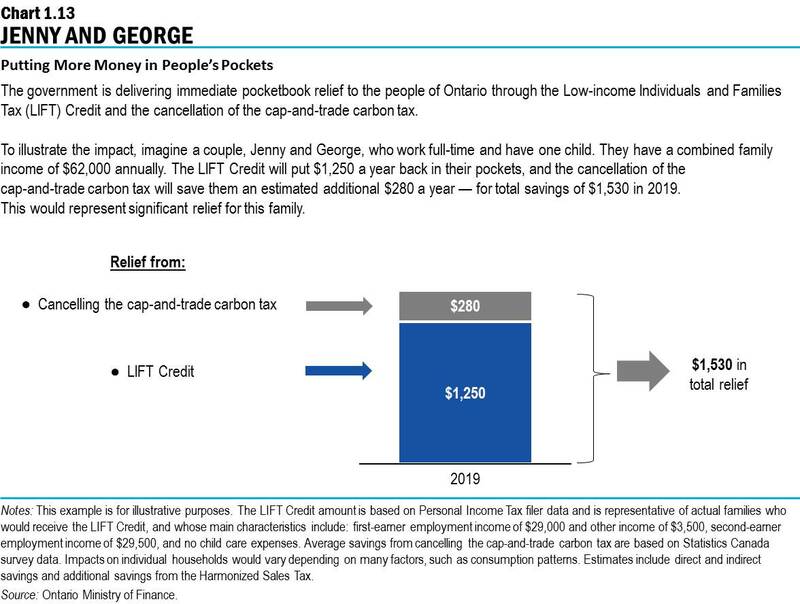 The government is delivering immediate pocketbook relief to the people of Ontario through the Low-income Individuals and Families Tax (LIFT) Credit and cancellation of the cap-and-trade carbon tax. To illustrate the impact, imagine a couple, Jenny and George, who work full-time and have one child. They take home a combined family income of $62,000 annually. The LIFT Credit would put $1,250 a year back in their pockets, and the cancellation of the cap-and-trade carbon tax would save them an estimated additional $280 a year — for total savings of $1,530 in 2019. This would represent significant relief for this family. Notes: This example is for illustrative purposes. The LIFT Credit amount is based on Personal Income Tax filer data and is representative of actual families who would receive the LIFT Credit, and whose main characteristics include: first-earner employment income of $29,000 and other income of $3,500, second-earner employment income of $29,500, and no child care expenses. Average savings from cancelling the cap-and-trade carbon tax are based on Statistics Canada survey data. Impacts on individual households would vary depending on many factors, such as consumption patterns. Estimates include direct and indirect savings and additional savings from the Harmonized Sales Tax. This bar chart illustrates savings and costs in 2019 for a couple, Alice and Raymond, who work full-time and have two children, Avery and Jack, ages two and eight, respectively. The parents have a combined family income of $100,000 annually, and have $13,000 in eligible child care expenses in 2019. Alice and Raymond would save $3,733 in 2019 through the following initiatives: savings from cancelling the cap-and-trade carbon tax ($288), the CARE tax credit ($3,510) and the federal reduction in EI premiums ($31) as well as costs from the federal CPP contribution increase (-$96). 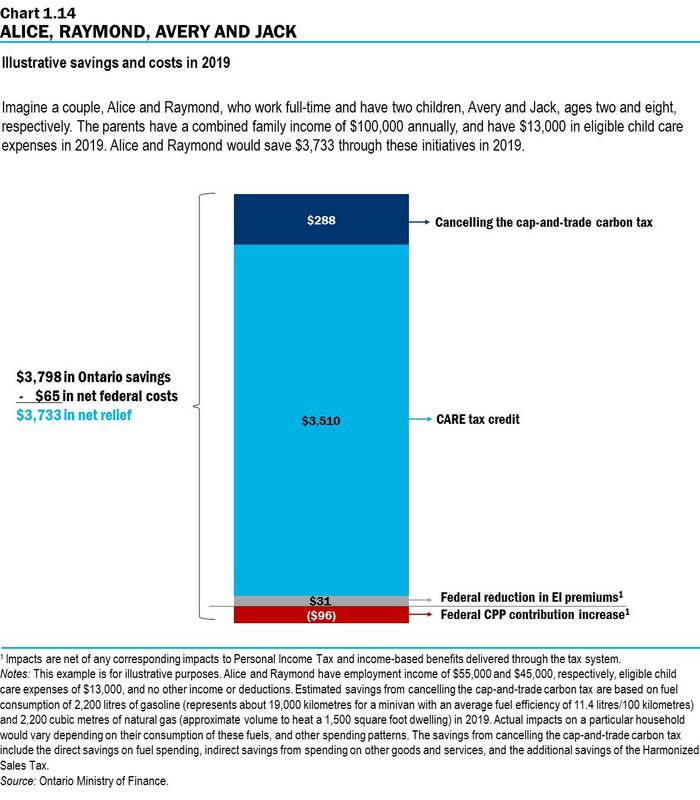 Alice and Raymond would have $3,798 in Ontario savings, minus $65 in net federal costs for an overall net relief of $3,733. Notes: This example is for illustrative purposes. Alice and Raymond have employment income of $55,000 and $45,000, respectively, eligible child care expenses of $13,000, and no other income or deductions. Estimated savings from cancelling the cap-and-trade carbon tax is based on fuel consumption of 2,200 litres of gasoline (represents about 19,000 kilometres for a minivan with an average fuel efficiency of 11.4 litres/100 kilometres) and 2,200 cubic metres of natural gas (approximate volume to heat a 1,500 square foot dwelling) in 2019. Actual impacts on a particular household would vary depending on their consumption of these fuels, and other spending patterns. The savings from cancelling the cap-and-trade carbon tax include the direct savings on fuel spending, indirect savings from spending on other goods and services, and the additional savings of the Harmonized Sales Tax. Impacts for the federal reduction in EI premiums and federal CPP contribution increase are net of any corresponding impacts to personal income tax and income-based benefits delivered through the tax system. 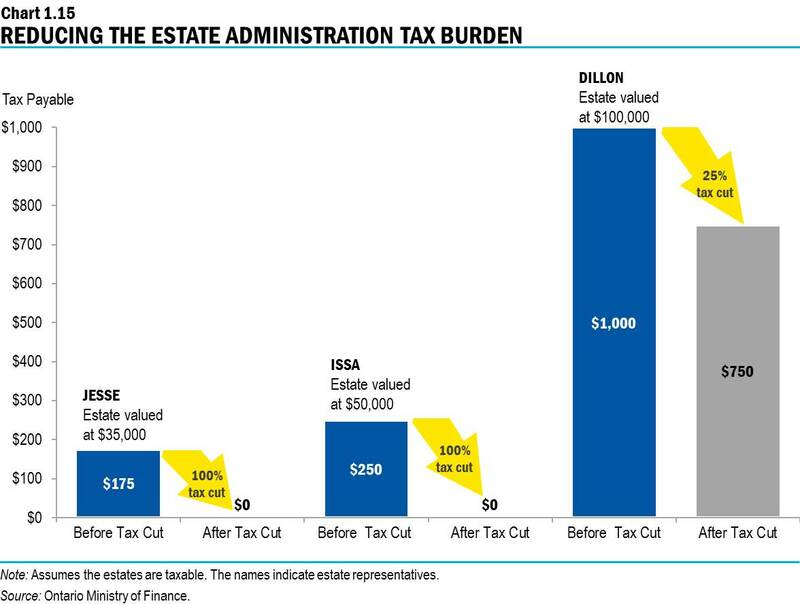 This bar chart compares the Estate Administration Tax that estate representatives would be required to pay on behalf of taxable estates of three different values, calculated before and after the proposed tax cut. Left section: Before the proposed tax cut, Jesse, the representative for a taxable estate valued at $35,000, would be required to pay $175 in Estate Administration Tax on behalf of the estate. After the proposed tax cut, Jesse would pay $0 — a 100 per cent Estate Administration Tax cut. Middle section: Before the proposed tax cut, Issa, the representative for a taxable estate valued at $50,000, would be required to pay $250 in Estate Administration Tax on behalf of the estate. After the proposed tax cut, Issa would pay $0 — a 100 per cent Estate Administration Tax cut. Right section: Before the proposed tax cut, Dillon, the representative for a taxable estate valued at $100,000, would be required to pay $1,000 in Estate Administration Tax on behalf of the estate. After the proposed tax cut, Dillon would pay $750 — a 25 per cent Estate Administration Tax cut. Note: Assumes the estates are taxable. The names indicate estate representatives. 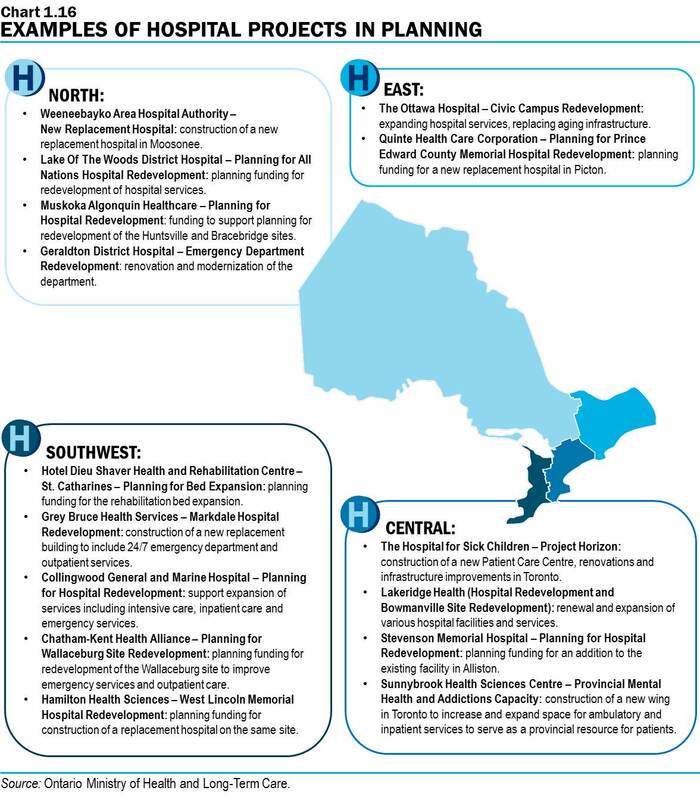 This map provides examples of health infrastructure projects in planning across Ontario. North: Weeneebayko Area Hospital Authority – New Replacement Hospital involves construction of a new replacement hospital building. Geraldton District Hospital – Emergency Department Redevelopment, involves renovation and modernization of the department. East: The Ottawa Hospital – Civic Campus Redevelopment will expand hospital services, and replace aging infrastructure. Quinte Health Care Corporation – Planning for Prince Edward County Memorial Hospital Redevelopment is receiving planning funding for a new replacement hospital in Picton. Central: The Hospital for Sick Children – Project Horizon involves construction of a new Patient Care Centre, renovations and infrastructure improvements in Toronto. Lakeridge Health (Hospital Redevelopment and Bowmanville Site Redevelopment) involves renewal and expansion of various hospital facilities and services. Stevenson Memorial Hospital – Planning for Hospital Redevelopment is receiving planning funding for an addition to the existing facility in Alliston. Sunnybrook Health Sciences Centre – Provincial Mental Health and Addictions Capacity: construction of a new wing in Toronto to increase and expand space for ambulatory and inpatient services to serve as a provincial resource for patients. Southwest: Hotel Dieu Shaver Health and Rehabilitation Centre – Planning for Bed Expansion is receiving planning funding for the rehabilitation bed expansion. Grey Bruce Health Services – Markdale Hospital involves construction of a new replacement building to include 24/7 emergency department and outpatient services. Chatham-Kent Health Alliance – Planning for Wallaceburg Site Capital Redevelopment is receiving planning funding for redevelopment of the Wallaceburg site to improve emergency services and outpatient care. Hamilton Health Sciences - West Lincoln Memorial Hospital Redevelopment is receiving planning funding for construction of a replacement hospital on the same site. 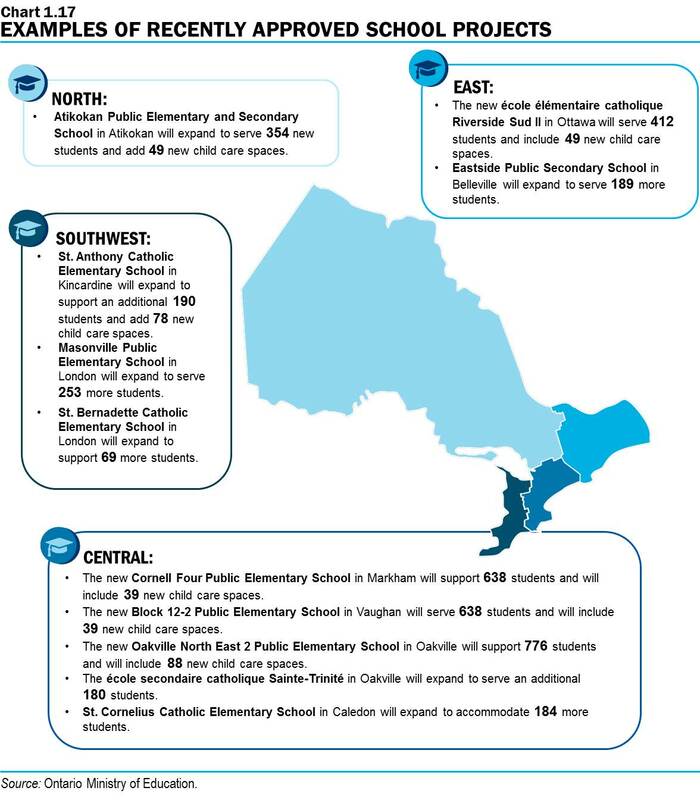 This map shows examples of schools that are to be newly constructed or renovated across Ontario. North: Atikokan Public Elementary and Secondary School in Atikokan will expand to serve 354 new students and add 49 new child care spaces. East: The new école élémentaire catholique Riverside Sud II in Ottawa will serve 412 students and include 49 new child care spaces. Eastside Public Secondary School in Belleville will expand to serve 189 more students. Central: The new Cornell Four Public Elementary School in Markham will support 638 students and will include 39 new child care spaces. The new Block 12-2 Public Elementary School in Vaughan will serve 638 students and will include 39 new child care spaces. The new Oakville NE 2 Public Elementary School in Oakville will support 776 students and will include 88 new child care spaces. The école secondaire catholique Sainte-Trinité in Oakville will expand to serve an additional 180 students. St. Cornelius Catholic Elementary School in Caledon will expand to accommodate 184 more students. Southwest: St. Anthony Catholic Elementary School in Kincardine will expand to support an additional 190 students and add 78 new child care spaces. Masonville Public Elementary School in London will expand to serve 253 more students. St. Bernadette Catholic Elementary School in London will expand to support 69 more students. 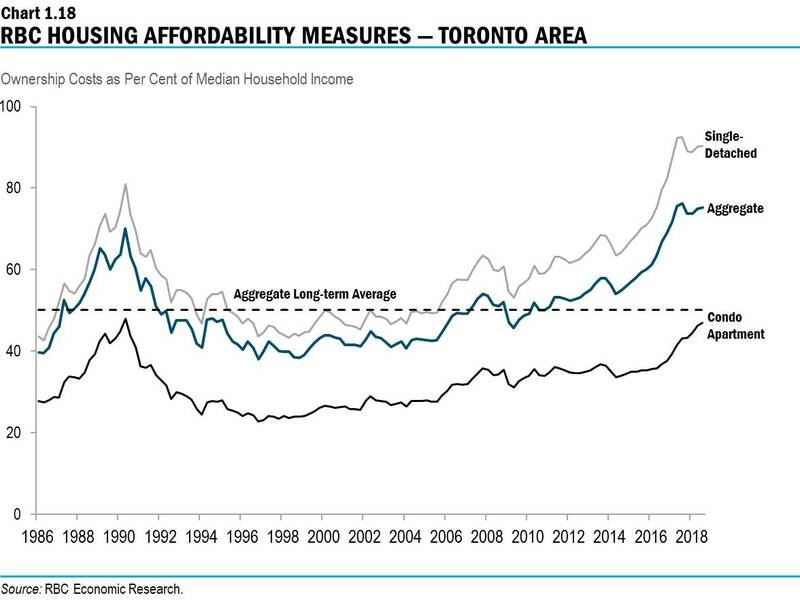 The line chart shows the RBC Housing Affordability Measures for the Toronto area for single-detached homes, condo apartments and an aggregate for all categories between the first quarter of 1986 and the third quarter of 2018. The RBC measures show ownership costs as a per cent of median household income. The long-term average for the aggregate measure is also shown. The chart shows that from the second quarter of 2009 until the third quarter of 2018, all three measures have generally been rising. Throughout the period shown in the chart, the single-detached home measure is the highest among the three measures shown while the condo apartment measure is the lowest. The highest value of the single-detached home measure was 92.6 recorded in the third quarter of 2017. The lowest value of the single-detached home measure was 42.7 recorded in the second quarter of 1986. The highest value of the condo apartment measure was 48.0 recorded in the second quarter of 1990. The lowest value of the condo apartment measure was 22.8 recorded in the fourth quarter of 1996. The highest value of the aggregate measure was 76.2 recorded in the third quarter of 2017. The lowest value of the aggregate measure was 38.1 recorded in the fourth quarter of 1996. The RBC Housing Aggregate Affordability Measure was 75.3 in the third quarter of 2018. This compares to the long-term average (between the first quarter of 1985 and the third quarter of 2018) of 50.1. The single-detached RBC Housing Affordability Measure was 90.4 in the third quarter of 2018 while the condo apartment RBC Housing Affordability Measure was 47.0. 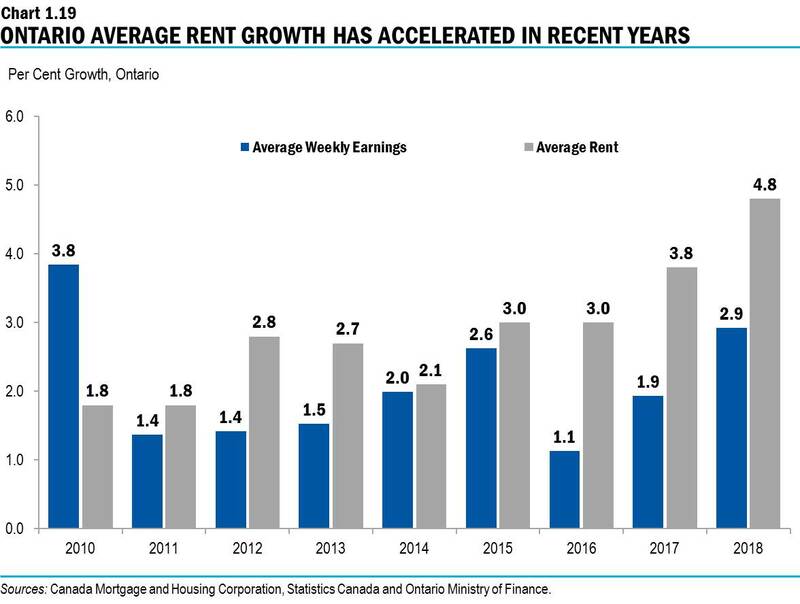 The bar chart shows annual growth in average rent and average weekly earnings in Ontario from 2010 to 2018. Average rent increased 1.8 per cent in 2010, 1.8 per cent in 2011, 2.8 per cent in 2012, 2.7 per cent in 2013, 2.1 per cent in 2014, 3.0 per cent in 2015, 3.0 per cent in 2016, 3.8 per cent in 2017 and 4.8 per cent in 2018. Average weekly earnings increased 3.8 per cent in 2010, 1.4 per cent in 2011, 1.4 per cent in 2012, 1.5 per cent in 2013, 2.0 per cent in 2014, 2.6 per cent in 2015, 1.1 per cent in 2016, 1.9 per cent in 2017 and 2.9 per cent in 2018. Sources: Canada Mortgage and Housing Corporation, Statistics Canada and Ontario Ministry of Finance. All data provided is approximate. 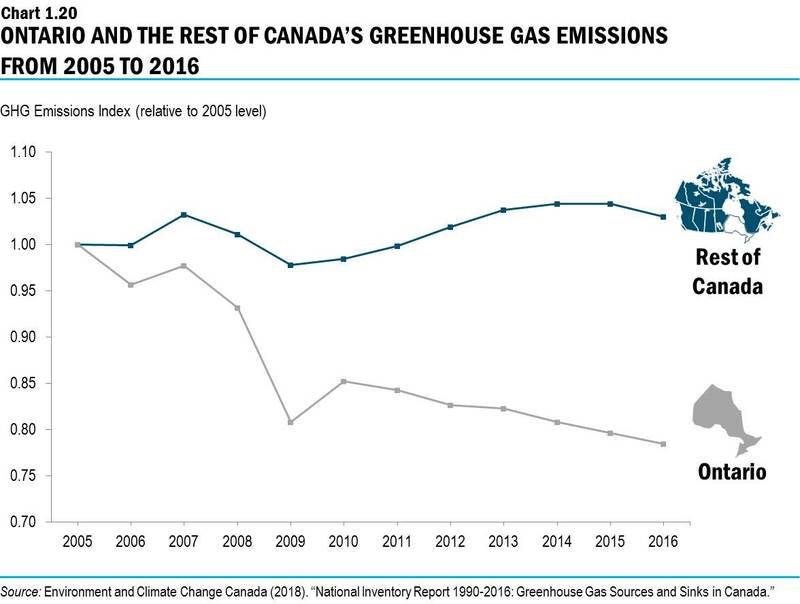 Source: Environmental Climate Change (2018) National Inventory Report 1990–2016: Greenhouse Gas Sources and Sinks in Canada. Ontario Ministry of Finance estimate. For examples of related studies, see Kim, J. and Laurin, A., “Mothers at Work. The Fiscal Implications of the Proposed Ontario Childcare Rebate,” (2019), E-Brief, Toronto: C.D. Howe Institute. January and references cited. Wright, Craig and Hogue, Robert, “Housing Trends and Affordability,” RBC Economic Research, December 2018. Vacancy rate and average rent growth are based on the Canada Housing and Mortgage Corporation Rental Market Survey. These estimates refer to the primary rental market, which consists of units in privately initiated, purpose-built rental structures of three units or more. Data observations refer to October of a given year.